Yesterday, thanks to a render revealed by Android Police, we saw what's supposedly a near-final design of a new Google Pixel XL smartphone - a 6-inch handset reportedly manufactured by LG. Expected to be announced sometime this fall, the Pixel XL 2017 (or Pixel XL 2) could have at least one of the three color variants that the Pixel XL of 2016 has: black, silver, and blue. The render revealed yesterday showed a black Pixel XL 2017, so maybe you also want to see what the smartphone would look like in silver and blue. Thanks to Twitter user Benjamin Geskin, we can now take a look at what could be a next-gen Pixel XL in blue, as well as in silver. 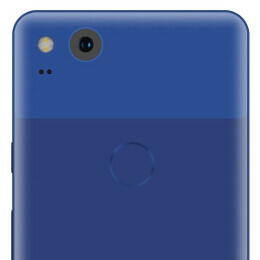 As you'll notice below, these blue and silver renders are based on the render from yesterday, which means they should be pretty close to the final design of the upcoming handset, thin bezels and all. As a reminder, the 6-inch display of the new Google Pixel XL is expected to be a flat one, although the glass covering it should be curved on the sides. The new Pixel XL might be officially unveiled in October, alongside a smaller, 5-inch second generation Pixel. We'll see then how close to reality these renders are. They need to either make the back all glass or all metal, this design choice was criticized by almost everyone. And it's not like there was wireless charging for them to slap a piece of glass on that back. Design looks great to me. Best looking phone I've seen to date. Same here. Looks similar yet far better. Ya that Blue looks gorgeous..
How does having a glass back on a mobile phone possibly make sense to anyone? 1- That's my opinion, glass, metal, and plastic all make sense to me. 2- Why would a company use both materials in the same phone? Isn't that a bit confusing for those who dislike glass phones or maybe those who hate metal phones? 3- It doesn't offer any extra functionality like wireless charging for example. Again, IN MY OPINION, it should've been either metal or glass. All caps? Calm down a bit. Surely, if you are able to express YOUR opinion. Why can't others share THEIR opinions? Isn't that the point of the comment section? Pwease no hate that was just my opinion LOL. Plastic all the way for me...but that's me. For wireless charging. However, that's not a crucial feature for me, and I do agree glass backs on mobile phones are silly. The reason they went with some glass on the back was wireless transmission. Having a window that doesn't attenuate RF signals translates to better signal transmission and reception. Personally I wouldn't want all metal for the reasons stated above, and I wouldn't want all glass because it's just asking for a repair down the road when it gets damaged. Just out of curiosity, why did so many OEMs switch to rounded corner screens this year? It seems weird that it seems to be a huge fad all of a sudden. Looks better the the original pixel, but I am still not sure I like the dual finish on the back. Ok can someone tell me...if the XL2 had a 6" 2:1 screen, how I'd be able to swipe down to view the notifications? Gestures? Or it probably won't be as difficult as u think? Frankly, i don't think you'll have much trouble tbh. The new launcher allows you to swipe down vertically from anywhere on the screen to pull down notification shade. The current Pixels have a swipe down on the fingerprint scanner to bring down the notification shade. A second swipe pulls it all the way down to show the quick toggles. A swipe up will hide it. Love the look of the black one. Glad I waited to pick up a new phone as the XL will be mine! I actually like the look of this a lot. A lot of us care. Now go back to your safe space. I want black front on that blue one.